Although once seen as speculation and fantasy, virtual-reality technology is now rapidly entering the world of entertainment, film and sporting events. According to a recent report by PwC, the consumer VR market in the USA alone is expected to be worth $5 billion by 2021, with just under $3 billion of that expected to be spent on virtual reality video. As the VR wave continues to gain momentum, we’ve been keeping an eye on how sports leagues and teams are embracing the technology that could potentially change the way we watch sports events for ever. In the last year alone we’ve seen CBS broadcast six NCAA basketball championship games in VR and heard that the NBA will be streaming one weekly NBA League Pass game in VR, and it’s not just the basketball leagues taking the leap. Last month, Intel True VR announced it would be working with Major League Baseball to deliver a live-streaming game of the week, and partnering with the PGA Tour’s Players Championship to launch the Tour’s first live virtual reality production. The significant investment by some of the largest sports leagues around the world is made even more interesting when you look at the obvious hurdles that the technology needs to overcome before it is considered truly mainstream. Using available audience data from Global Web Index, we analysed behaviours and preferences to learn about sports fans and their interest in VR and VR headsets. Firstly, we identified which sport has the highest share of VR headset owning fans. 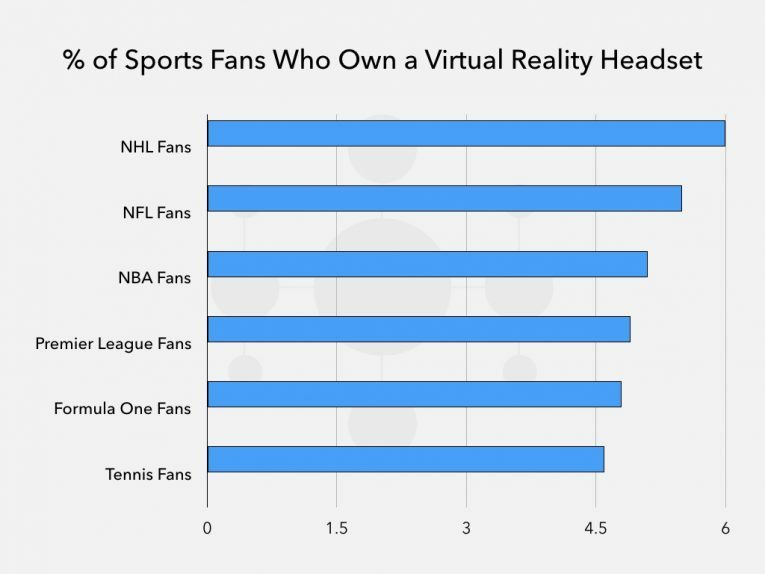 Here we saw 6% of NHL fans state they own a VR headset, then we had the NFL where 5.5% of fans said they own a VR headset, followed by fans of the NBA, where 5.1% own a VR headset. These percentage shares are just above the average of sports fans who own a VR headset (4.5%). It was the fans of early adopters of VR, the Jacksonville Jaguars and the Tampa Bay Buccaneers who came out on top. In 2015, the Jaguars partnered with VOKE, one of the world’s leading VR companies, to provide fans with an enhanced game day experience. With the Buccaneers using the technology with their coaching staff and players. 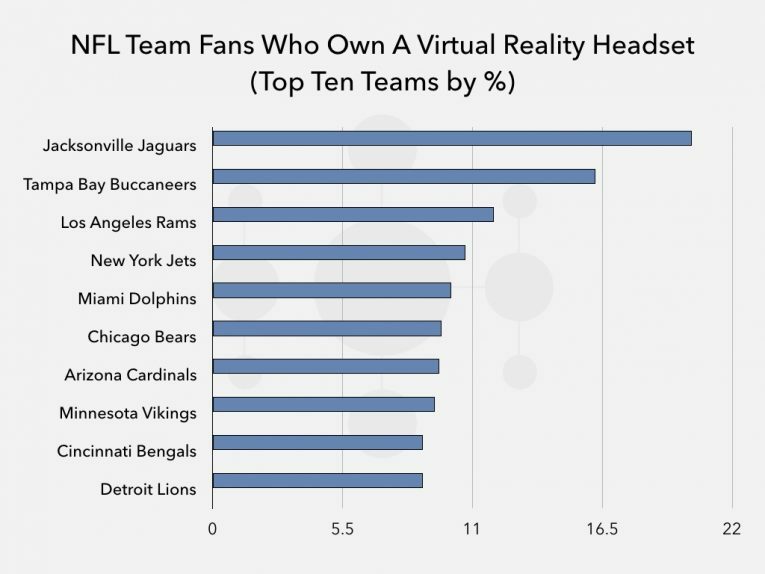 Interestingly, 11.9% of Los Angeles Rams’ fans stated they own a VR headset, yet compared to other NFL teams, the Rams are late adopters of the technology for both fan experience and players’ development. 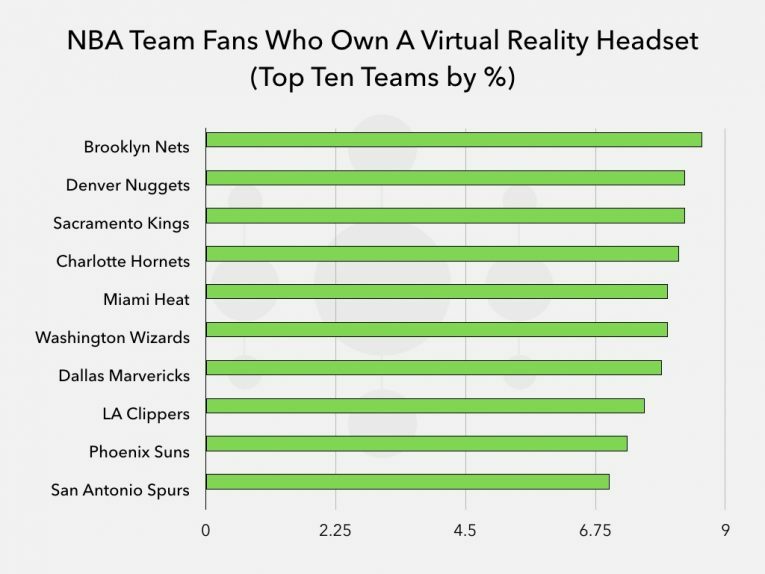 Looking at the fans of NBA teams, 8.9% of the Brooklyn Nets fans and 8.3% of Sacramento Kings fans said they own a VR headset. However, not all NBA team owners are onboard. Dallas Maverick owner Mark Cuban has recently stated “I would rather be in the top row at a game than watching a live VR stream, and I don’t see that changing in many, many years.” This is despite the Mavericks’ arena being one of only three arenas to be wired for VR, and almost 8% of their fans owning a VR headset. 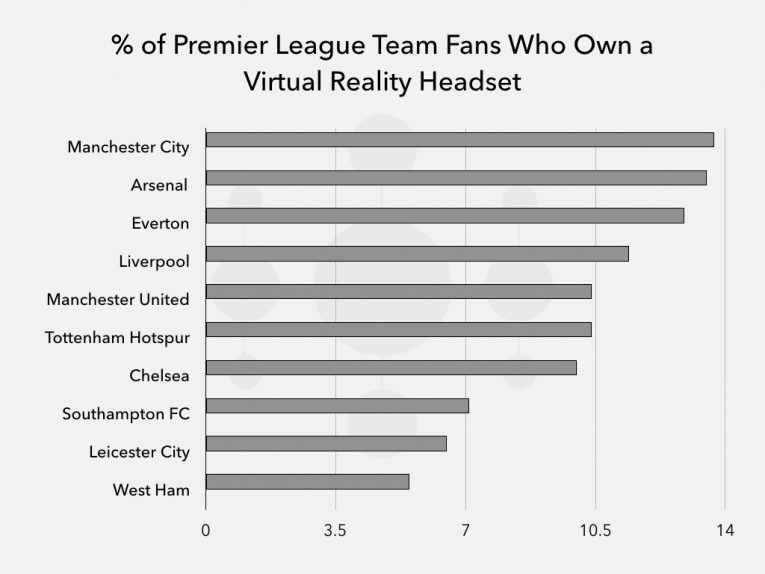 Over in the English Premier League, it was Manchester City’s fans who took the top spot, with 13.7% of their fans stating that they own a VR headset, closely followed by Arsenal (13.5%) and Everton (12.9%). This is significant because Manchester City are known to be early adopters of technology and have been experimenting with VR for quite some time. 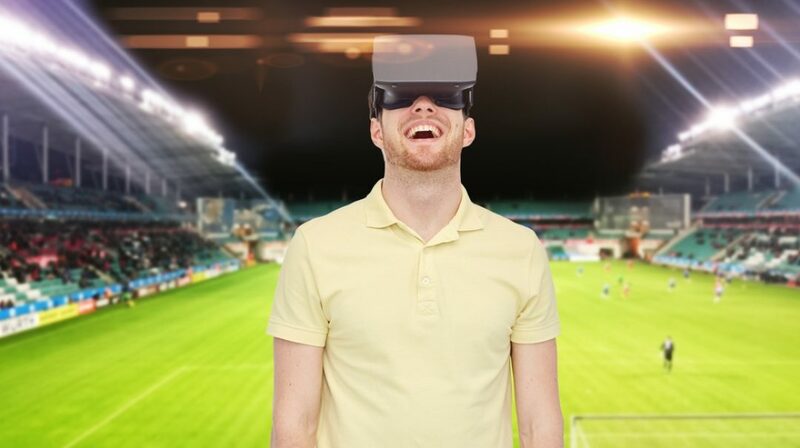 Despite an average of just 4.5% of all sports fans currently owning a VR headset, Global Web Index research shows that 46% of sports fans have expressed an interest in owning the technology in the future. No doubt this will come as welcome news to the digital savvy sports teams and leagues across the globe, and to the fans who will become one step closer to the action.